Slow Cooker Spicy Black Eyed Peas - black eyed peas, chicken broth, green onions, tomatoes, jalapeños, red pepper, pepperoni and rice. It is a meal in itself! Just add some greens and cornbread to complete the New Year's Day spread! 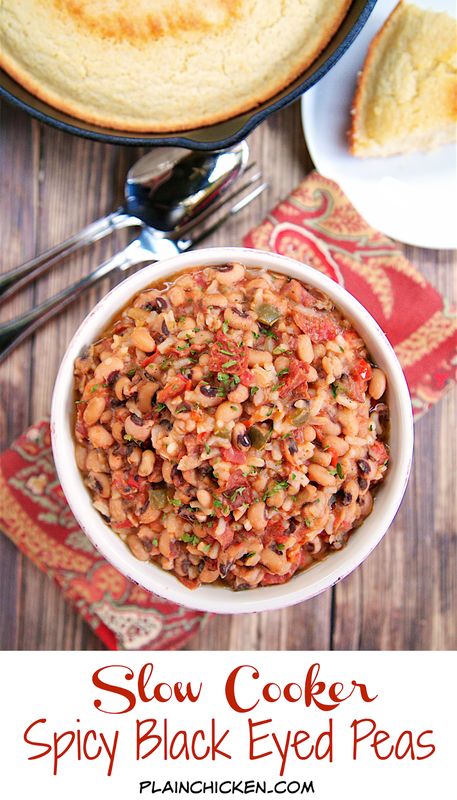 Black eyed peas are an absolute must for New Year's in The South. 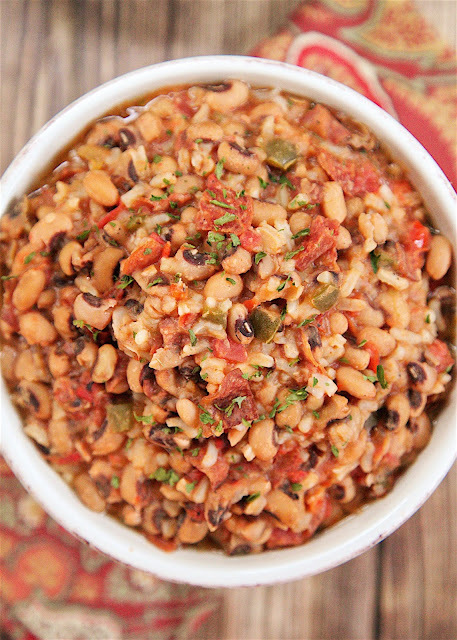 You must eat black eyed peas for good luck in the new year. 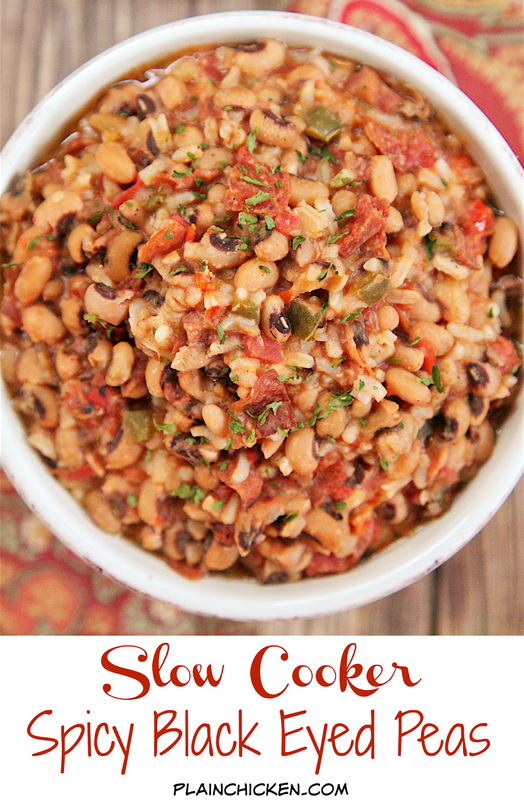 I have several recipes for black eyed peas, but I am always open to try a new one. I ran across this recipe in one of my cookbooks and decided to give it a try. I'm so glad I did. It was great! Black eyed peas, chicken broth, tomatoes, jalapeños , red pepper, pepperoni and rice. It is a meal in itself! Just add some greens (for wealth in the new year) and cornbread to complete the New Year's Day spread! Place dried black eyed peas in slow cooker. Cover with water 2 inches above peas; let stand 8 hours or overnight. Drain. Combine soaked black eyed peas, green onions, red bell pepper, jalapeño pepper, pepperoni, chicken broth, chicken bouillon, salt, ground red pepper and stewed tomatoes in slow cooker. Cover and cook at LOW 8 hours. Stir in rice; cover and cook an additional 30 minutes. I love the idea of pepperoni in this, sounds interesting! Can't wait to make it. OMG...so looking forward to making this! 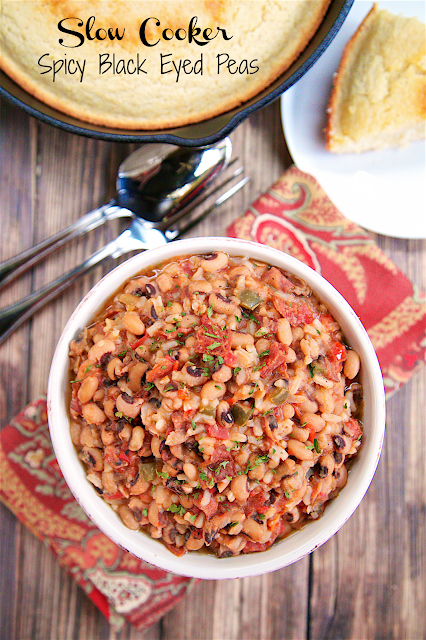 I always make "Hopin' John" to eat on New Years Day. Will definitely be adding the greens for prosperity. Yum! Wishing you a Lucky and Prosperous 2016! Very Good Recipe, ,only thing I would do differently is rinse out the stewed tomato can with water and add to the recipe for a little more liquid, mine came out a tad dry so with addition of liquid you have a Great Recipe,,My Wife is a black eye pea eater and really enjoyed this recipe,,thxs for sharing..Blessings..